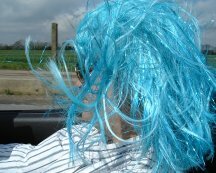 The Original one and only Wind Stop Test! 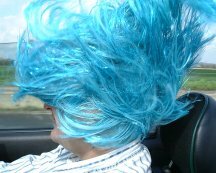 Fun, wind-in-the-hair driving is what owning an MG roadster is all about - so you might reasonably be wondering "why on earth bother with a wind stop"? You might even be wondering what a wind stop is! 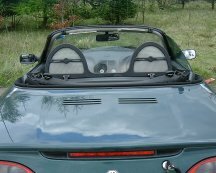 A wind stop, very simply, is a device that reduces the wind buffeting inside the cabin when the roof has been stowed away. 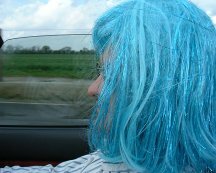 As a result, it can be a very useful device if you, or your partner, has long hair. 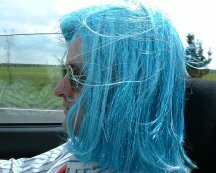 You will probably already be aware of how unruly long hair becomes on a fast trip with the roof down! Therefore the answer to "why bother?" becomes very obvious! 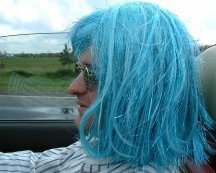 Rob 'Blue' Bell, Paul and Fran Sharpe, Andy 'Scarlet Fever' Phillips and Tom Randell... and let's not forget the star of the show - the Blue Wig! But what wind stop should you buy? Good question indeed! At the time these original wind stop tests were performed back in 2000, there were already a confusing number of options available - from MG themselves, Newton Commercial (also retailed by others including Brown and Gammons and Moss International) and Mike Satur. The situation since then has changed - but only because now there are even more varieties of wind stops to choose from! The style of wind stop that Mike Satur provided for these tests is now sadly no longer available - but similar plexi-glass wind stops are now available from a variety of sources, including both the MGF Centre and indeed Mike Satur. 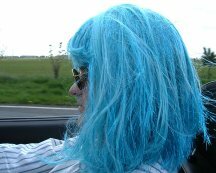 However, I do still have that infamous blue wig, so perhaps I should consider a repeat of the One and Only Windstop Test! The full original report can be found in MG World back issue archive (August/September 2000 issue, number 18, pictured right), so what you find here is a simple round up of the three top selling wind stops available at that time. To source a copy, look up the CHP Publications back-issues website. What have we compared these wind stops with? If you scroll down, you'll find we've done two tests without a wind stop fitted - why? 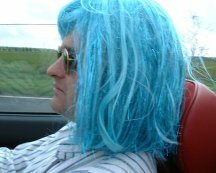 In the first test, we wanted to see what happens when you drive with the roof lowered and both windows raised - which is, I suspect, how the majority if owners will drive on a fast open road. 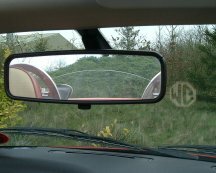 The second test was with the driver's window lowered. 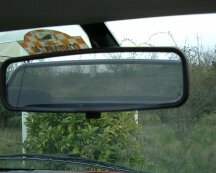 This was to determine whether what some people say - namely driving with one window lowered is really an improvement over driving with both windows raised. Looking at the results below provides the answer! These tests no longer provide the definitive answer to the original question of which is the best wind stop on the market - for the very simple reason that there are now so many more wind stops available. That said, there remain essentially two classes of wind stop: the mesh and the plexi-glass. You'll see below that the two mesh-design wind stops have very similar performance. I would anticipate that all plexi-glass type wind stops will behave similarly to. With this in mind, you can probably go forward and investigate the various options for yourself on the basis of what you read here. For alternative wind stops and DIY solutions, click here. 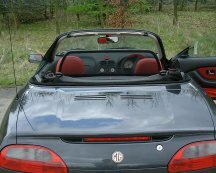 So if you haven't fitted a wind stop to your MG yet... look at the pictures and make your own mind up! Me? 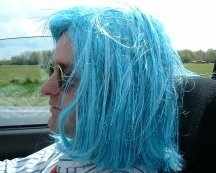 Well, I used to have a Mike Satur wind stop, but for you? Check out the pictures, figures and ratings below and make your own mind up. Interested in buying a wind stop? See the trader's index here for contacts. 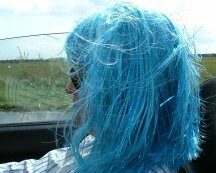 Drive roof down, windows up, an option that costs you nothing - except time untangling your hair afterwards!!! This is the standard fare from MG. You need to drill holes in the T-bar to fit- so removing it is going to leave unsightly holes... oh dear. But it works very well! This is the cheapest wind stop on the market and it doesn't require drilling to fit. Probably the flimsiest built here, but it works well, and that counts. Most expensive, but is the best built, best looking, easiest to fit... the list of advantages go on. Mike Satur has improved the mesh design since this test, so high speed performance may have been improved over the wind stops tested. The ratings summary results can be harsh. 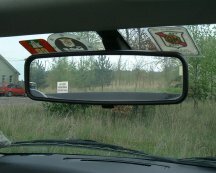 The "no-wind stop" options score very highly because they obviously don't cost you anything or obscure the rear view. 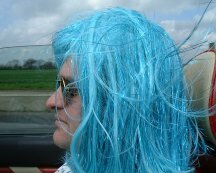 However, as far as driving comfort is concerned, they're appalling compared to what the best wind stops offer. Performance wise, you're looking at only at 1 or 2 stars out of five. 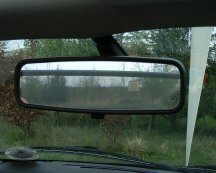 But it is interesting to note that what people say is true: it is better to drive with the driver's window lowered! The winner of the wind stop test is largely influenced on how you calculate value for money. The Newton Commercial wind stop is easily the cheapest wind stop option here and is very easy to fit without destroying trim. But it is flimsy in feel compared to the other wind stops we tested - particularly compared to the Mike Satur kit. Therefore, in our eyes, the Newton Commercial wind stop just fails to beat the 40 quid more expensive MG wind stop over all. The Plexi-glass wind stop? We marked up the value for money scoring because it is wonderfully over-engineered. 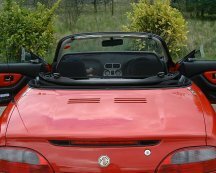 It is also exceptionally easy to fit - and if you want to remove it from the car - for example, when you want to fit the hard top - this too is a simple process of unfastening a couple of knurled bolts, and off it comes. But it is still 100 quid more than the Newton offering. And sadly, for what ever reason, performed poorly in the effectiveness tests. It came last on our score board.